Spectacular views of the Casa de Campo Dye Fore golf course from this spacious three bedroom, three bath penthouse condominium. A newly constructed unit which spared no detail in decoration, includes a double sized master bedroom with its own sitting area. Modern comforts such as broadband wi-fi internet, central air conditioning, and iPOD docking station. Infinity pool, jacuzzi, and BBQ area. L'Occitane bathroom amenities! A golfer's dream come true, this modern, luxurious condo comes with a full time maid who can perform light cooking upon request. Includes access to a modern, first class gym right next door. 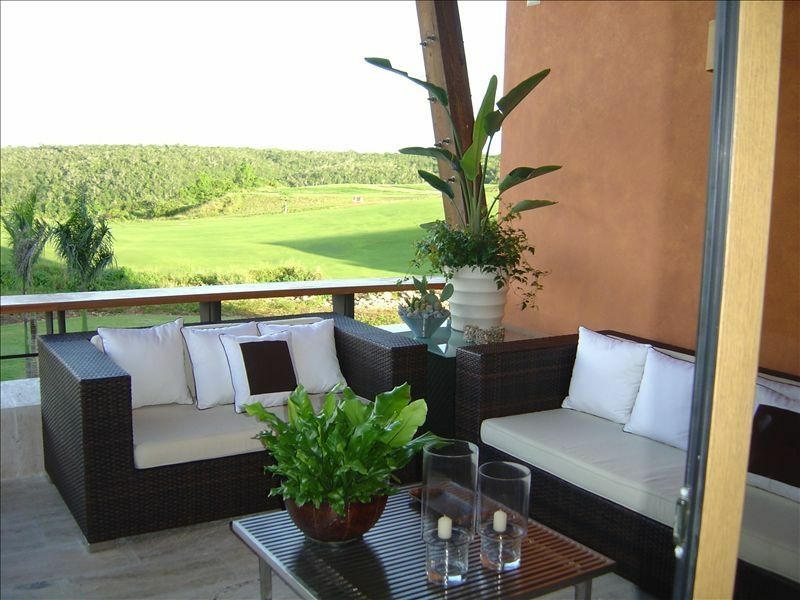 All the amenities of the Casa de Campo, daily resort fee applies. Enjoying the balcony and the view! We've loved visiting Casa de Campo for years -- it is simply the most wonderful resort, with 3 world class golf courses, the largest marina in the Caribbean, a wonderful beach, many restaurants, and the beautiful Altos de Chavon village. When we learned that a brand new modern project would have sweeping views of the Dye Fore golf course and the modern amenities of a brand new construction, it was an easy decision to select Los Altos. We most enjoy spending our mornings and evenings on the expansive patio which has sweeping views of the Dye Fore golf course. The house is wired for music throughout so we bring our iPOD and enjoy our favorite music while enjoying the tranquility of the golf course views. Even though it's a vacation spot, we enjoy using the gym which has all new equipment and cardio machines with cable TV. After all of that, we like to spend the day on the beach, or for special occassions to rent a boat and head to the secluded Palmilla beach or Saona island for a day out in the pristine Caribbean waters.